Another company I had scheduled to repair and clean my carpet cancelled on me the morning he was supposed to be at my home. After being up moving furniture, cleaning, and shoving stuff in the adjoining rooms until 11:00 the nite before, hearing that this company could come in a couple more days wasn't a happening thing. I called Hew' and, although he sounded like he was very busy, came out that evening. He repaired a hole in the middle of our carpet which I can still not find, and cleaned my carpet until I was happy with it. I would definitely recommend him to a friend. 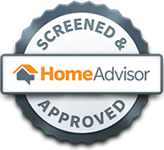 Hew's Carpet Care has passed HomeAdvisor's screening process including checks for criminal background and bankruptcy. The major carpet manufacturers recommend a professional cleaning every 12 to 18 months to maintain the appearance and warranties of your carpeting. We can keep your furnishings looking their best with regular maintenance. Don't go a minute longer with stained, dingy or unhealthy carpets. When we remember how we use our furniture every day, the necessity for proper professional care becomes clear. Special attention must be given to cleaning upholstery as it can consist of different fibers. We wouldn't recommend using the same cleaning products for carpet on your upholstery as upholstery may consist of different types of fiber that need to be treated differently. When the correct care is given, upholstered furnishings will last for many years. Upholstery can be cleaned by steam, foam, or dry cleaning. Orientals need special care, but they're worth it. We will remove dry loose soil and precondition your rug with emulsifiers to loosen dirt and oils. We gently and thoroughly hand wash and rinse your delicate rug with a pH-balanced cleaning solution. Any spots on your rug are carefully removed with spot removers. The rug is then rinsed again to remove any spotting residues. After washing, a neutralizer is applied to restore the original pH of your delicate rug to make it like new. We use the Host dry cleaning procedure that is especially formulated to clean natural fibers found in oriental rugs. The product will loosen the soils and leave the fibers soft without harming the dyes. Any spots on your rug are carefully removed with spot removers. Fringe cleaning and texturizing can also be done. Your rug is picked up and delivered at no additional charge. Dirty air ducts can cause allergies and asthma. Removing contaminants from air duct systems is one of the best ways to control dust and reduce indoor air pollution. Your air ducts are ideal breeding grounds for fungus, mold, spores, and bacteria. Whenever the heat or air conditioner is on, these contaminations are blown into your home. Fact: 1 of 6 people who suffer from allergies do so because of the direct relationship to the fungi and bacteria in air duct systems. Recommendation: people suffering from asthma should have the air ducts cleaned every 6 months. For allergies, once a year. No allergies, every two years. We offer 24 hour, 7 day emergency service. We disinfect water damaged areas of your house. Your carpet will need to be cleaned before bacteria and spores form causing respiratory problems. A water extraction process will disinfect the carpet. We use a water extraction machine to extract water out of both carpet and pad without ripping your carpet. To finish the process we use dryers and dehumidifiers to dry your home quickly to prevent further damage.